The Shamanic Priestess process is an enlightening movement that heals our inner feminine while empowering us to continue that healing and carry our power into the world as wholed women. I cannot say enough, really I cannot articulate, how powerful this process is. In lieu of that, I am going to share here some of the initiations and ceremonies we co-create during the Process, in hopes that you can imagine how this empowers women. The first weekend theme is Healing the Inner Maiden. None of us reach adulthood unscarred. In the first of the initiation cycles, we work with our inner maiden and heal some of her deepest wounds through living ceremony*, journaling, music, movement and sharing in circle. 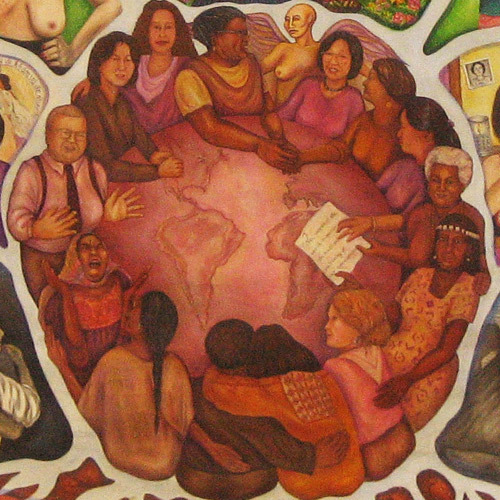 As women in a circle, we also connect deeply with one another and begin to see how we can help other woman heal, how we can support while also being supported–not the endless giving without receiving that we may have been taught but holding each other up and, in our turn, being held up within this powerful circle. Initiation and working with the Inner Patriarch. We all have a voice inside us that speaks with from the place of our Patriarchal over-culture. In this part of the process, we connect with, listen to and deeply examine the power that our Inner Patriarch holds over us and are able to see whether this is healthy or not. We are allowed to release this voice, this archetype, from our psyches if we need to and to recreate a new, powerful, healthy Patriarch to help and guide us. Conscious Death and Rebirth was one of my favorite weekends. I loved being able to choose to let go of certain parts of myself and also to call in new pieces to honor and embrace. After dying to the things you let go of, spend some time in limbo–some time between the worlds–where you can simply float and be, before calling in the new you! Powerful, thrilling, heady work. There are several other themes that women who are part of a Shamanic Priestess circle will work through. These are just a sampling of my favorites. In between SPP weekends, the circle will meet on its own to process, check-in and spend time together without the facilitators. Circle starting in Chesapeake, VA on the weekend of Sept 13-14, 2014: Four Oaks We have several options for women who would like to come but need overnight accommodation. Anyaa McAndrew’s website: Goddess on the Loose, where you can find several articles on the Shamanic Priestess process and a bio on Anyaa who will facilitate the circle in Chesapeake. *living ceremony- Women in the circle co-create ceremonies in the moment, as a part of the process.